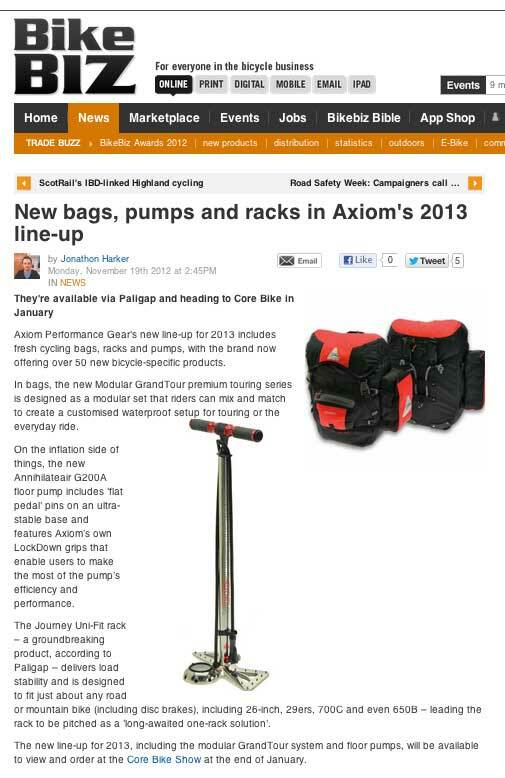 « Axiom Performance Gear’s new line-up for 2013 includes fresh cycling bags, racks and pumps, with the brand now offering over 50 new bicycle-specific products. « In bags, the new Modular GrandTour premium touring series is designed as a modular set that riders can mix and match to create a customized waterproof setup for touring or the everyday ride. « On the inflation side of things, the new Annihilateair G200A floor pump includes ‘flat pedal’ pins on an ultra-stable base and features Axiom’s own LockDown grips that enable users to make the most of the pump’s efficiency and performance. Browse Axiom bags, pumps, racks and other Axiom cycling gear.